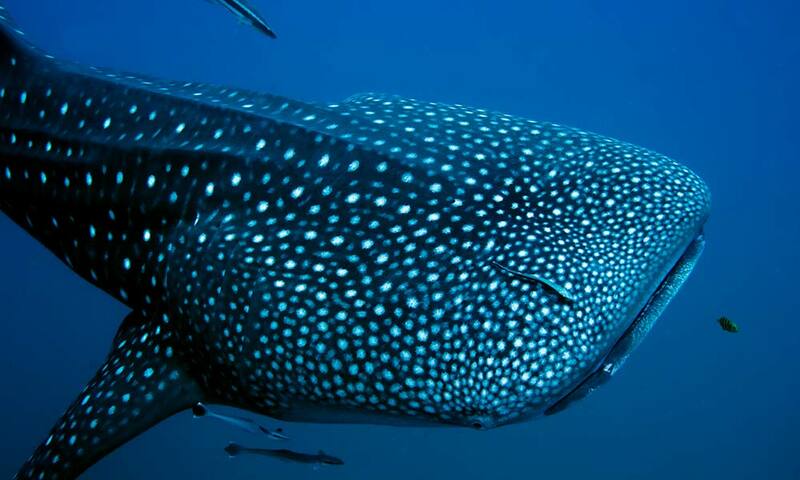 The whale shark is the world's largest fish, yet surprisingly little is known about it. We are still to discover where they go to breed, give birth and spend the first few years of their life. These basic life history elements are not only interesting to know but also important if we are to successfully conserve this gentle giant. 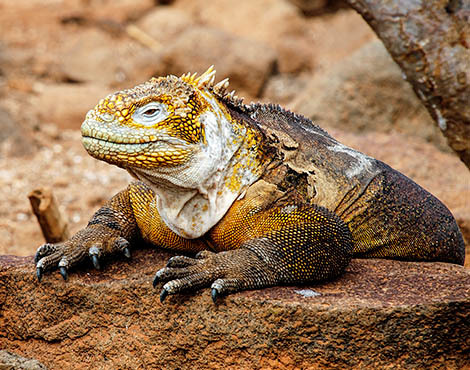 A ground-breaking research project in Galapagos hopes to deliver some of these crucial insights into their lives. 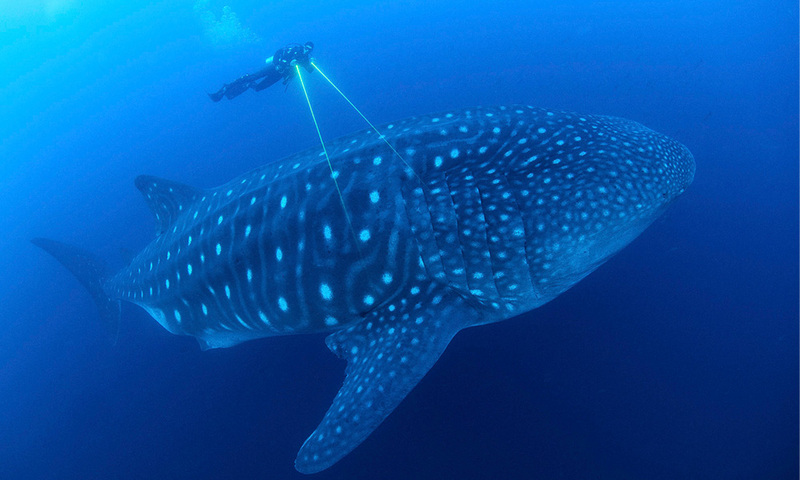 The Galapagos Whale Shark Project aims to deliver some of these crucial insights into the lives of whale sharks. 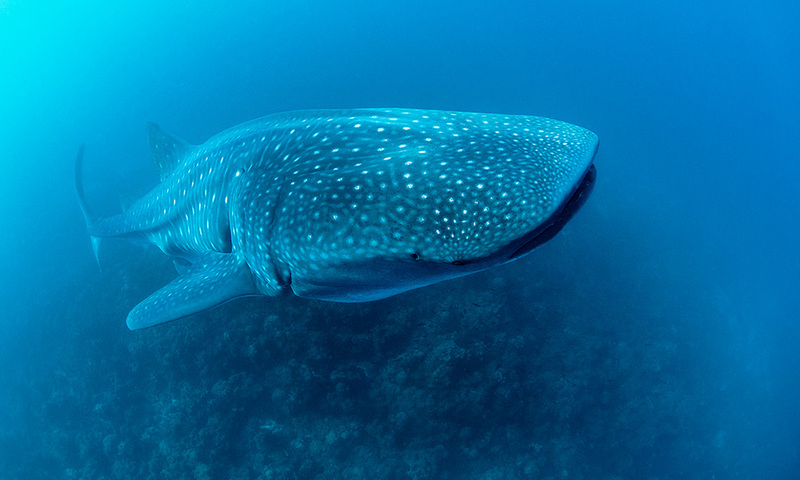 The Galapagos Islands are one of several locations that whale sharks are known to visit at certain times of year. 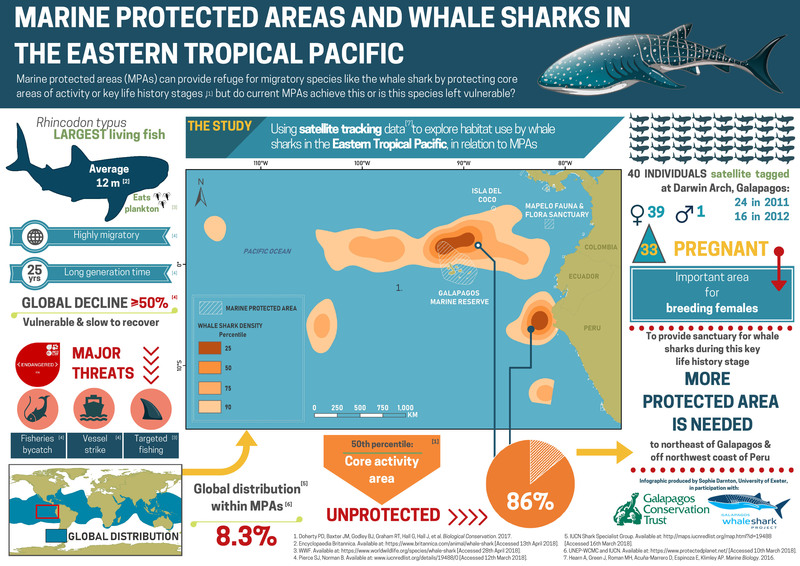 Unlike aggregations in the Indian Ocean, which are largely made up of small immature males, the majority of sharks sighted in the Galapagos Marine Reserve are large mature females, a high proportion of which (over 90%) appear to be pregnant. By tagging individual whale sharks, the team is hoping to build a robust set of data that will tell us about their migration behaviour. Once we understand more about migratory patterns, it can be determined what action needs to be taken to protect this magnificent ocean giant. 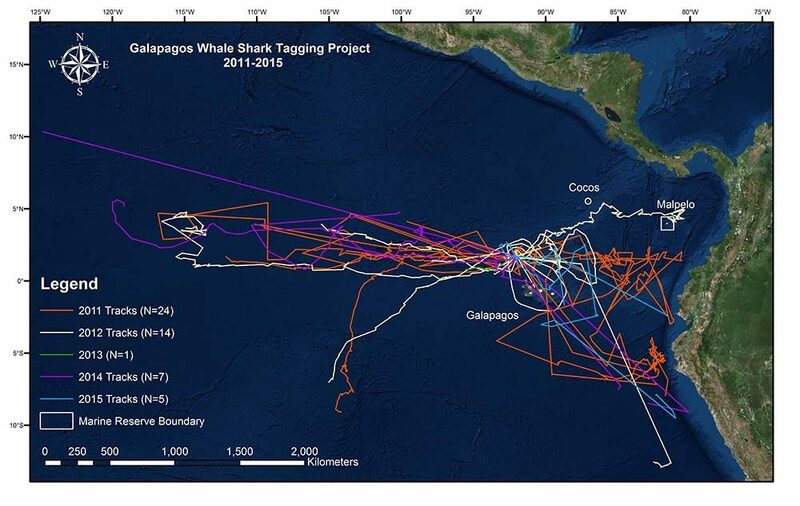 Since 2011, the Galapagos Whale Shark Project has tagged over 60 whale sharks in order to record the position of the sharks each time they surface which allows their migration to be tracked. 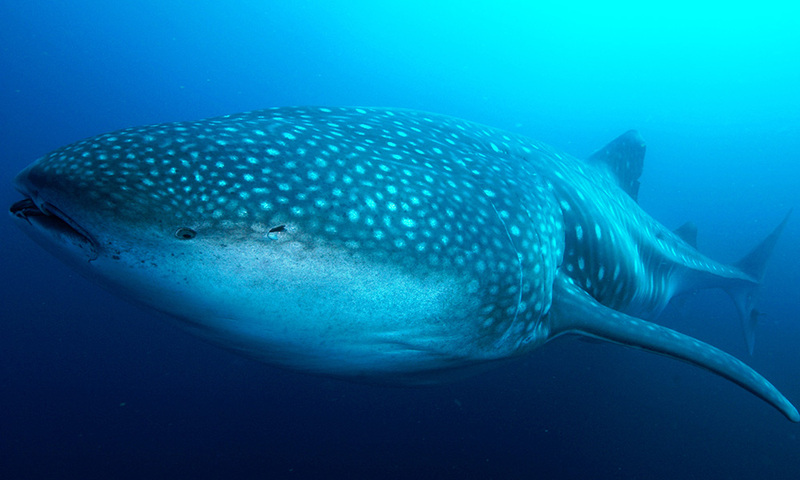 The Galapagos Marine Reserve, and specifically Darwin island, appear to be important areas for whale sharks. The tracks suggest that Darwin island provides an important point for navigation for the sharks, on their way to feeding grounds in the Pacific Ocean. In addition to understanding the sharks’ migration, the team have also been looking into whether the sharks are, indeed, pregnant. They have collected blood samples and are trialling ultrasound methods. Both aspects of the sharks’ life history are important for educating local authorities and communities both in Galapagos and on mainland South America, so that effective management strategies can be devised. The first ever ultrasound of a whale shark was taken in the wild. First ever mature male was recorded in the Galapagos Marine Reserve. Scientific paper was published on association with oceanic fronts, potentially for feeding or pupping. 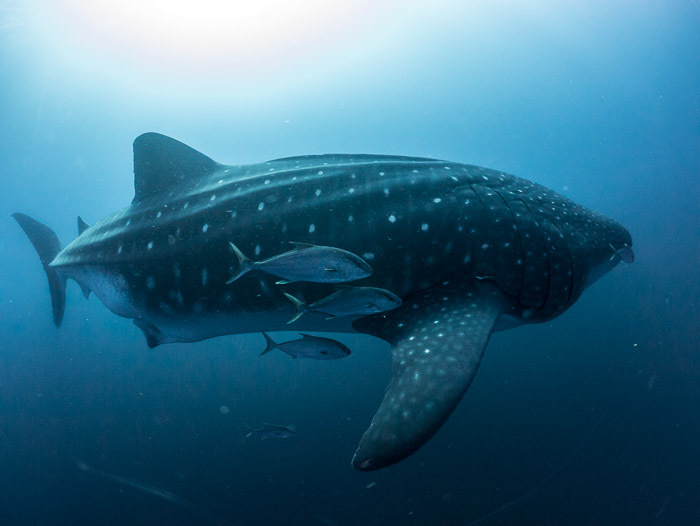 In order to ensure that whale sharks are effectively protected the team need to continue improving our understanding of how whale sharks use the Galapagos Marine Reserve, and to educate key stakeholders. They will continue to satellite tag individual sharks, take tissue samples for population genetic research, undertake aerial surveys using drones and try to prove, finally, that the female sharks are actually pregnant. Please help us conserve these gentle giants today by giving a donation to marine projects, adopting a Galapagos animal or joining up as a GCT member. Find out more about the largest fish in the ocean.